Travel to an exotic land with timeless designs inspired by Turkish Iznik tiles from the Ottoman Empire. Bursting with flora and organic symmetry, the book's exquisite fusible appliqu? projects will take your breath away. Your journey begins with the basics' choosing the right fabric, thread, and needles for hand-stitched or machine appliqu?. 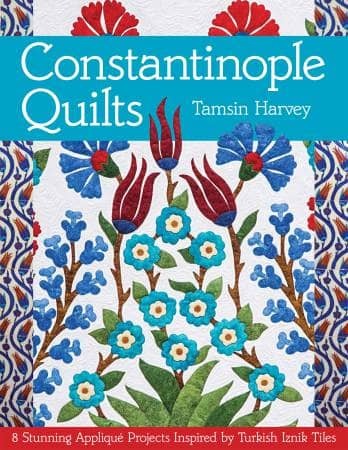 Newer or busy quilters can start with table runners or bags and work their way up to Tamsin Harvey's stunning master quilts. Location photography enhances 8 patterns that effortlessly go from ancient places to contemporary spaces. Written by the owner of Berrima Patchwork - Tamsin Harvey. If you would like this book to be signed personally to you please leave a message in the note section when checking out with the name you wish it to be sign to.